Photo from Derek Price, no reproduction without permission. 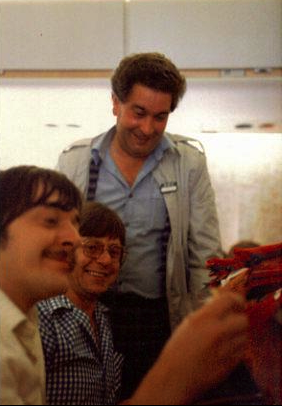 Nigel Evans, Ian Dewar and myself (Derek Price) on the way to Houston, Texas in July 81 in a DC10, to meet Vic Damone, the American singer and entertainer, and bring him back for ‘Pebble Mill At One’. Jane Mclean adds that John Smith and/or Jim Dumighan may also have been involved in the trip.